PST Merge software supports Outlook 2000, 2003, 2007, 2010, 2013, 2016 (32/64 bit) versions. 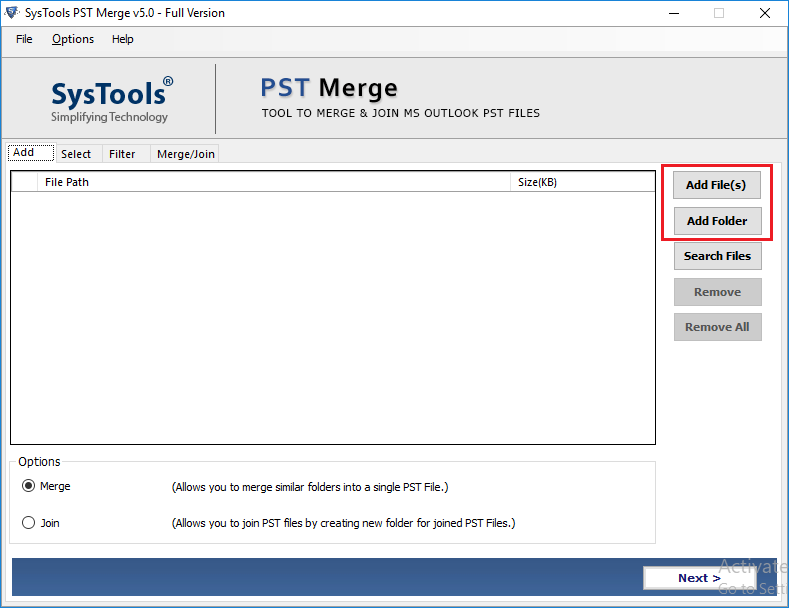 The Outlook 2016 PST Merge tool enables users to join more than 2 Outlook database files by creating a new folder. This folder consists of the merged PST file, which is also having duplicate items within it. The PST file merger application provides a feature to merge all data of similar PST folders into one. For example, there are two PST files i.e., PST1 and PST2. These files are having Inbox1 and Inbox2 folders within it. Our PST file merger software will merge emails of Inbox 1 and Inbox 2 folder into one and name that folder as Inbox. Users can merge Outlook 2016, 2013, 2010, and below, contacts folder separately from multiple files. This feature is quite useful for those who want to backup Outlook contacts separately from a set of PST files. 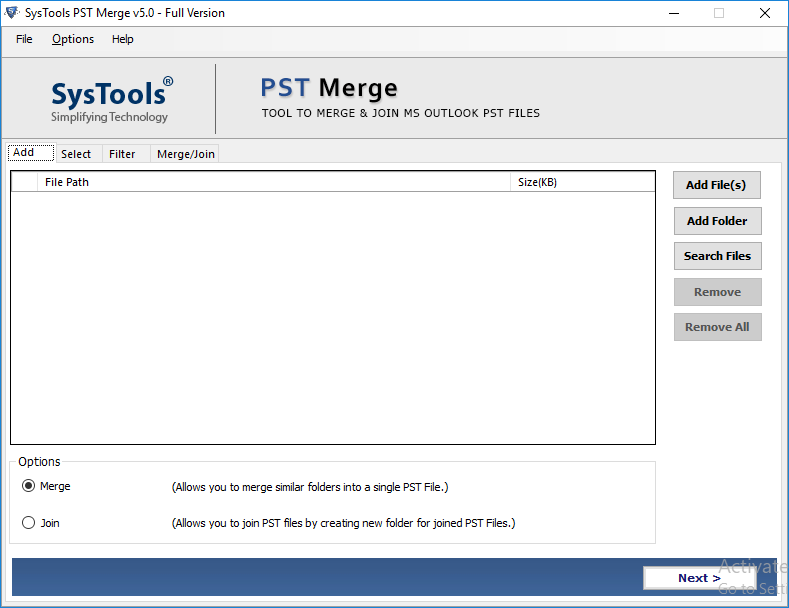 The PST merge software will create an individual PST, which will be having all address book data merge in 1 folder. Remove Duplicates: This will remove the same items from multiple PST file and generate one PST. This file will not be having any duplicate emails, contacts, etc., within it. Exclude Deleted Items: Users can eliminate Deleted Items folder from being merged. It is quite obvious that users do not want this folder data to merge. Therefore, our software renders option to remove it. Add Files: Users can add two or more PST files for merging in a one-by-one manner. This option is useful for users who want to choose files from different machine location. Add Folder: This option is used to browse a folder, which consists of several PST files within it. The folder can have any number of Outlook files within it. File of any Outlook version like 2016, 2013, and all below can be added to a folder and browsed. An advance setting option is provided by the PST Merge software through which users will be easily able to manage combined PST files. Users can split their resultant PST file in the desired size. This will help in reducing the overall size of consolidated PST file. 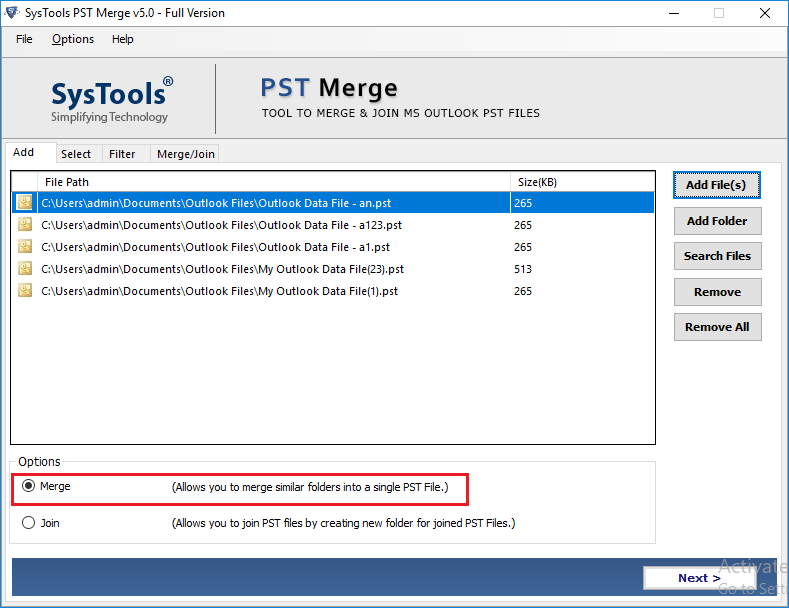 The Outlook 2016 PST Merge software holds the data consistency of actual files. It will work without causing any kind of deviation in the existing content or folder hierarchy of PST files. So, don’t worry about deformation of data at the time of combining Outlook archives/data files. Outlook should be installed and configured for valid or dummy profile/account (i.e. Not Configured for Exchange) to join two PST files. Explain the functioning of PST Merge Tool? Step 1: Install & run the Outlook PST Merger Tool. Step 2: Click on Add File/Folder button to add PST files or folder containing a bulk number of files. Step 3: Choose any one option from the given 3 options to join the PST files accordingly. Step 4: You can also Exclude deleted items. Step 5: Then, browse to the destination path and click on "Merge PST Files" button. Step 6: Now, the process will start and the software will also show the status of the process. Step 7: After complete merging process, navigate to the saved location and view the merged PST file. Step 8: You can import that PST file in MS Outlook and view all the data items from multiple PST files in that email application. Can I merge Outlook archive files of 2010 with help of your utility? Yes, our PST file merger software supports combining of PST archives files of any Outlook version. Does your software require Microsoft Outlook installation for joining multiple PST files into one? Yes, our PST Merge application needs Outlook as its supportive program. How many PST files can be united with this software at once? An unlimited number of PST files can be merged with our utility. It is important that the chosen files must not be opened in Outlook. What time is consumed in combining 20 PST files with this tool? The consumed time is totally dependent upon the size and numbers of browsed files. The PST merge software takes less time in comparison to all other products available for the same in the market. "I had utilized this software of FreeViewer for the first time, after a deep research for Outlook PST file Merge. This application is having outstanding features of merging PST files of Outlook 2010. Without comprising any data loss, I was able to join multiple PST files into one." "I was having around 10 PST files with and wanted to save address book information of these files, separately. 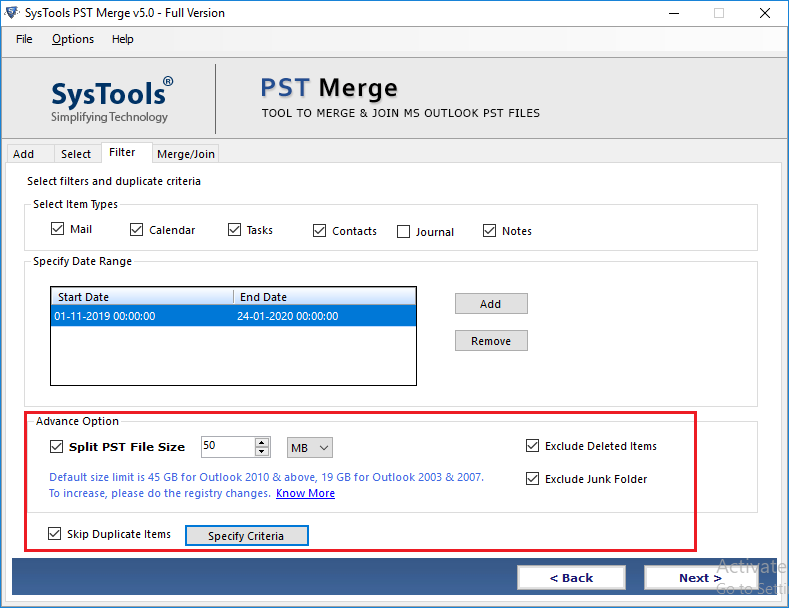 Therefore, I utilized this PST merge tool to combine Outlook Contacts Folders of 2013. Within just 3 clicks I was having all my contacts separately saved in an individual PST." "Without many efforts, I was able to perform the merging process. 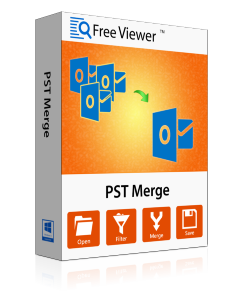 With the help of FreeViewer PST Merge Tool, I was able to combine large Outlook PST files in a very less time. I found that there was no data loss in the output file. It was a good experience of using this utility." "The interface of the PST Merger tool is very simple that even a non-technical user can also understand and run the tool. With the help of technical assistance from FreeViewer team, I was able to merge 50 PST files in a very less time. Thanks to the FreeViewer team for developing this tool!"